U.S. Ambassador to the United Nations Nikki Haley speaks during a Security Council meeting on the situation in Iran, at United Nations headquarters in New York, Jan. 5, 2018. The South Sudan government has reacted angrily to remarks made by U.S. Ambassador to the United Nations Nikki Haley, in which she called the government an “unfit partner” to the U.N.
A South Sudanese Foreign Ministry official said Friday that Haley's remarks threaten to undermine relations between the U.S. and South Sudan. Haley did not mince words about President Salva Kiir's government as she addressed the U.N. Security Council on Wednesday. “The government of South Sudan is increasingly proving itself to be an unfit partner for this council and any country seeking peace and security for the people of South Sudan. The United States will never give up on its efforts but if there is to be true peace in South Sudan, its leaders must step up and make a true commitment to end this conflict once and for all,” said Haley. Haley also accused President Kiir of promoting three generals who she said led the slaughter of innocent South Sudanese women, children, and elderly people — the same generals who were sanctioned by the Security Council in 2015. Haley said the Security Council must do more, such as imposing an arms embargo on South Sudan to slow the flow of arms and ammunitions entering into the country. President of South Sudan Salva Kiir speaks on the occasion of the sixth anniversary of his country's independence at the presidential palace in Juba, July 9, 2017. Baak Valentino Wol, Undersecretary of South Sudan's Foreign Affairs Ministry, criticized Haley’s remarks. “Ambassador Nikki made many undue defamatory and inflammatory remarks on the situation in South Sudan including her uncalled for arms embargo. 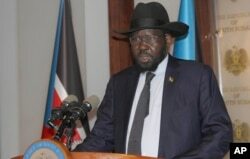 Ambassador Nikki’s remarks do not serve well the good relations which the people and the government of South Sudan always wish to exist between the two people and governments,” Wol told reporters at a news conference in Juba on Friday. Wol said his ministry summoned the U.S. Charge d'Affairs Michael Murrow to clarify Haley’s remarks. “I cannot get up in the morning and insult the president of another country or say something bad about the government of another country and hope that such statements will foster peace and good relations between nations; it doesn’t. That is why we called the representative of the U.S. administration to tell him that we are not happy,” Wol added. South Sudan’s civil war, now in its fifth year, has displaced some four million people and created a humanitarian crisis in the world’s youngest country. Recently displaced families who arrived five days before claiming that government troops attacked their towns, shelter in a run-down school in Akobo, near the Ethiopian border, in South Sudan, Jan. 19, 2018. Meanwhile, the Washington-based Enough Project said inaction from the African Union and the East Africa bloc IGAD (Intergovernmental Authority on Development) has contributed to prolonging the conflict in South Sudan. Deputy policy director Brian Adeba said empty threats have helped create an atmosphere of impunity in the conflict. “The African Union doesn’t seem to be keen on following through on the threats that they have made. And that actually contributes to creating impunity among the spoilers. They know they can get away with it. They know they can violate any cessation of hostilities or any ceasefire and get away with it because no one is going to hold them accountable,” Adeba told VOA's South Sudan in Focus. Between IGAD and the African Union, 20 statements have been released since December 2013, condemning the violence and promising to hold perpetrators accountable. In past statements, both the AU and IGAD have threatened asset freezes, visa bans and arms embargoes on those responsible for prolonging the conflict. 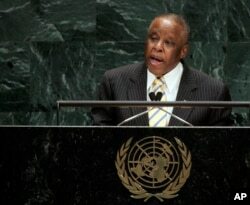 Festus Mogae addresses the 62nd session of the United Nations General Assembly, Sept. 26, 2007. Festus Mogae, chairman of the Joint Monitoring and Evaluation Commission, the body that monitors South Sudan's 2015 peace agreement, has also repeatedly called for measures such as an arms embargo and travel bans. This week, Mogae told the U.N. Security Council it must consider other options. “It is now time to revisit the range of practical measures that can be applied in earnest to those who refuse to take this process seriously and make clear to all consent that the world will not tolerate any further disruption to our efforts to deliver peace,” said Mogae. A UN-backed arms embargo could stem the flow of weapons to South Sudan but Adeba argues that move relies too heavily on the African Union. “If the African Union is opposed to an arms embargo it cannot happen at the Security Council, the Security Council members tend to follow the cue of the African Union. What we have seen in the past is that member countries of the African Union on the Security Council have been very reluctant to support an arms embargo,” Adeba told VOA. Adeba said the next round of talks to revitalize the 2015 peace agreement cannot be business as usual. New talks are scheduled to open in Addis Ababa on Feb. 6. Haley called on IGAD to ensure that the parties find the political will to compromise on longer-term security and governance arrangements. If they don’t, Haley said, the Security Council should work with the region to find a new path to peace.